Well hello, there! Long time no post, I know. If you’ve been following along for the past 9+ months, you know that my husband, Don, and I were expecting a baby girl this January. She decided to make an early appearance in late December instead. We are over the moon, head over heels in love with our little girl! 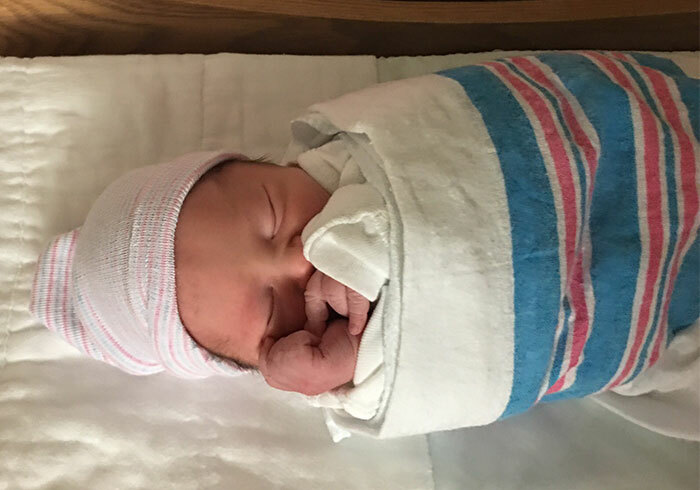 Today I wanted to share about our delivery story as well as introduce you to our baby. Charlotte weighed 6 pounds, 6 ounces and measured 20 inches at birth. She’s a long, lean, baby machine! Meet our little girl, Charlotte Claire Ross, nicknamed “CC” (or Princess Angel Face as Don is fond of calling her), named after my late grandmother. I was actually named after her mother and it felt fitting to carry on the family tradition of naming on my maternal side. CC was born on December 28, 2015 via c-section with a full head of hair and long legs. We were immediately smitten with our little angel. We found out that CC was in a frank breech position (basically a jack knife) at my 36 week doctor’s visit. I went into detail on my efforts to try to get the baby to flip on her own in my 37 week update video. In short, my efforts were not effective. I had a strong feeling that CC had tried to flip but was unable. I felt pretty certain she was wedged in there pretty tight and my suspicions were confirmed after delivery when I found out my heart-shaped uterus was the reason for her prenatal positioning. We decided to go ahead and attempt an external version, where my doctor tried to manually turn the baby, just after I flipped into my 38th week of pregnancy. This is a procedure that is performed in the labor and delivery ward of the hospital as there is a chance of triggering labor or needing an emergency delivery. We went to the hospital prepared to deliver via c-section after an emergency run the previous week following a low amniotic fluid reading. I was sent home that first time as the fluid level reading at the hospital was back in the safe normal range, but we knew there was a good chance it would be low once again plus with the breech situation my doctor had cautioned us to be prepared to deliver that day. We felt fortunate that our baby had at least a few more days to mature in utero and that we could spend the Christmas holiday with our families. I took the opportunity that Sunday to tie up all of the loose ends around the house in preparation for baby’s arrival, including a major clean sweep, laundry, and putting the final touches on the baby’s room. I fasted before the procedure, which is customary in the event of needing surgery, and we checked into labor and delivery at the hospital around noon on Monday the 28th. I changed into a hospital gown and they hooked me up to an IV as well as monitors to track the baby’s heart rate and any contractions. A resident OB came in to check my fluid levels via ultrasound and they registered at 5, which is on the borderline between low and normal. My OB came in after having spoke to a specialist on the floor about the fluid level results and told us that they considered a 5 as “low,” which meant they were going to deliver that day. Fortunately, we were ready for that news so it was not a shock. I felt calm, prepared, and excited to meet my baby that day! We decided to still give the external version a try, because if I could have had a chance to labor and deliver vaginally I would have preferred it to the c-section, although I wasn’t opposed to having surgery if necessary. If the procedure had been successful they would have induced labor shortly thereafter. Unfortunately, it was not. I wouldn’t say it was incredibly painful, but it was extremely uncomfortable to have two doctors pushing that forcefully on my belly to get baby to move. She wouldn’t budge, though, and after about ten minutes of trying, my doctor said she didn’t want to risk distressing the baby and wanted to move to surgery. Things proceeded quickly after this point. They were ready to operate right away, although it wasn’t an emergency situation. Don got scrubbed up and was sent down to recovery with our things while I was prepped for surgery. I walked into the OR at 2:45 PM. My delivery nurse who had been with me since I checked in came as well as my OB. There was also an OR nurse, an OB resident, the anesthesiologist, and an anesthesia resident. They hooked me up to a blood pressure monitor, oxygen, and some sort of vitals monitoring devices on my chest. I sat up hunched over on the operating table leaning against my OB with my back facing the anesthesia team. The anesthesia resident performed the spinal block while the anesthesiologist supervised. The resident prepped my back and then proceeded with the spinal block. I only felt a slight sting initially and then just the sensation of something going into my spine. It started taking effect almost immediately. I was numb from my rib cage down, although I still had some sense of the lower half of my body. They had me lie down on the table with my arms extended out on boards and they put up a curtain at my chest to block the view of the surgery. At this point they invited Don in and started the final prep for surgery at about 3:10 PM. The last to arrive was the NICU team, at the ready to examine the baby after birth. The doctors made the incision at 3:16 PM and Charlotte was born at 3:19. Pretty quick! The NICU doctors whisked her to the side of the OR where a warm examination table was set up. She came out quiet, but started making the cutest soft crying noises I’ve ever heard soon after the NICU team started their examination. Music to my ears! My OB and the OB resident spent the next 40 minutes “putting Humpty Dumpty back together again.” CC was examined by the NICU team for about 15 minutes, during which they scored her 1 and 5 minute Apgar tests, both at a 9 (excellent!). I wasn’t able to move during this time, but Don took lots of pictures. I remember how sore my neck was from craning my head to see my girl. After the NICU team was done with their examination, the nurses took CC’s foot prints, put on her hospital ID bracelets, wrapped her up in what Don and I call a baby burrito (otherwise known as a swaddle), and handed her to Don. He held her close to my face so I could see her and tell her how much I loved her. I couldn’t wait to hold that girl! They moved the three of us into recovery just after 4 PM where I had to remain under surveillance by my delivery nurse for a couple of hours post-op. She got me all propped up and I was finally able to hold my baby. What an unbelievably special moment! I’m not a happy crier kind of gal, but I shed tears of joy at that moment. It was the sweetest moment of my life. We attempted breastfeeding for a little bit and I got to snuggle her skin-to-skin for awhile. After about an hour Don and CC were taken up to the Mother and Baby ward to start the check-in process. Don accompanied her to the nursery where she had some tests done (I believe a blood sugar test and hearing test, although I’m not exactly sure as I wasn’t there) and then was placed on a warmer bed before her first sponge bath. She passed all of her tests with flying colors during our hospital stay. Finally I was declared fit to leave recovery and was wheeled up to Mother and Baby to get settled into our room. The nurse on rotation checked me in and got me set up in the hospital bed, went over my medication schedule, and checked my incision. I was checked several times a day by both an OB and nurses during my stay to make sure I was healing properly and that my uterus was contracting back down as it should. This was rather uncomfortable at first as it involved pushing down on my abdomen which felt quite sore. Luckily, that got a lot better as the week progressed. It felt like ages before they brought our baby into the room, although in reality it was less than an hour. I couldn’t wait to hold that bundle again! I had a more successful go at breastfeeding for my second attempt. We ordered dinner and tried to settle in. Unfortunately, I was in a lot of pain that first night and didn’t end up sleeping a wink. Poor Don didn’t sleep either out of concern for me. CC slept like a champ, though, and woke up to feed regularly, which made me feel better. The doctor on call adjusted my medication and my pain level slowly decreased over the course of the next 24 hours to a more manageable amount. By the end of the week I was able to cut back dramatically on the pain meds and have been medication free since 10 days post-op. Sleep deprived new parents getting to know our little girl. I didn’t manage to sleep a whole lot during our stay at the hospital, because I’m not great at napping and I was focused on watching my baby at all times. I didn’t want to let our gorgeous girl out of my sight! Even sleep deprivation couldn’t bring me down from my new Mommy high. Don and I both fell instantly in love with CC and so enjoyed our first few days cuddling our little girl and learning about her needs. Living it up on New Years Eve in the hospital with our celebration dinner and real soda! We stayed in the hospital for a total of five days (four days post-op is customary at our hospital). I know a lot of people say they just wanted to go home as soon as possible after delivery, but I actually enjoyed our extended stay. I felt extremely well taken care of and secure knowing that there was such great support for us whenever we needed it around the clock. It wasn’t the most comfortable place for Don as he barely fit on the extra bed in the room, but he was a champ and stayed with us the entire time. Our time in the hospital flew by. We ate, slept (some), and watched movies, but mostly we spent our time taking turns caring for CC. Our families came to visit and swoon over our precious girl. I was grateful for this quiet time in the hospital to heal and become acquainted with our baby. My healing progressed well and our baby was in great health, so we were discharged on Friday, January 1. It seemed so fitting to start the new year at home as a newly expanded family. We’ve been home for a week and a half now and I feel as if we’re all adjusting nicely. Our dog, Winnie, has been such a trooper. She’s taken on the roll of watch dog and family protector with ease and follows me and CC around closely wherever we go, always keeping a watchful eye. I am limited in what and how much I can do for now as I continue recovering from surgery, but I have a feeling I’ll be back to my usual active self in no time. Don is taking great care of all three of his princesses, as he likes to call us, assuming dog walking duties until I’m allowed, doing all of the cooking, and reading Dr. Seuss books to CC during their nightly “Baby & Daddy” time. I am thoroughly enjoying my Mommyhood journey so far, including all of the ups and downs of figuring out breastfeeding and learning how to address CC’s needs. It’s not always smooth sailing, but I am beyond overjoyed that our girl is finally here with us. I can’t tell you how much I am enjoying breathing her in, watching her sweet face as she sleeps, and singing while looking into her eyes. It is a precious time and I am treasuring it. Thank you to all who have left such sweet, kind, and supportive comments on my social media over the past couple of weeks. Your words mean so much to me! I’m so happy to be able to share about this new journey with you. Please bear with me as I navigate this new way of life and find balance. 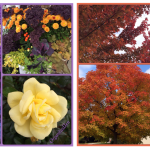 I will try to post as often as I can as I really do enjoy sharing with you. I hope you are all well and that 2016 is off to a great start for you and your loved ones. I had a dream about you and Don the other night so I came on your blog to check how your pregnancy was going. What a pleasant surprise. Congratulations on the birth of your baby girl. She is absolutely beautiful! Congratulations!!!! What a sweet, beautiful little girl. It will all come together. What a lovely way to start the new year. My very best wishes and congratulations to you both on the birth of your sweet angel, Charlotte (what a lovely name you chose). I wish you many joyous moments and happy adventures as you navigate parenthood. Little Charlotte is very blessed to have you and Don as parents. How Sweet! Congratulations to you and your beautiful family! Thank you for sharing your story! Jen So wonderful to see you all again! CC is just beautiful. I knew you would love being a mommy. It just keeps getting better and better, trust me. Thanks for posting and sharing. You are fondly in my thoughts and I am glad to see you all doing so well. I am so happy for you Jen! what a beautiful family. I was a little worried that Winnie might get jealous the first few weeks as your attention is no longer on her 100% but im so glad to hear she’s taken her big sister role nicely!! Enjoy the delicious moments ahead as in the blink of an eye she will be walking and running around!! Blessings to you and your beautiful family, and may I say Motherhood looks beautiful on you!!!! Congrats momma! Enjoy the newborn stage is passes too quickly! I think Charlotte looks just like your baby picture! Everyone else sees Don! She is gorgeous either way! I’m sure the grandparents are thrilled! I look forward to seeing how you remain organized! Love you and your family! Huge congratulations to you both. She is absolutely gorgeous and I’m so please you’re all doing well. Thank you for continuing to share your journey with us, you are all so loved. Be blessed. How wonderful for you guys! Your little one’s birthday is the day before one of my kids’ birthdays. Congratulations to you both! Enjoy your time together and these great moments as a new family of 3. I love the name too! I have always been a fan of “classic” names. Beautiful name for a beautiful girl. Congrats again! Nice to meet you CC. So cute. Congratulations again! 💕💕💕💕💕💕💕 so precious! Very thrilled for you all! God bless you and your family! Stay positive as you always do! CC is beautiful, I see true love in you. Awww!! You have shared so much thank you .. We have all been waiting and wondering.. She is perfect in everyday.. You look fabulous….. Well done Ross family!! Congrats on CC. She is so adorable. What a great way to start off the new year. CONGRATULATIONS!!! so extremely excited for you, don, & winnie! I started laughing at your burrito/swaddle reference because that’s what my husband and I call it too! my father in law calls our son “burrito boy” when he’s swaddled. can’t wait to hear more of little miss CC! I am so very happy for you. I only started following you this past fall, and I have since gone back and watched your pregnancy announcement. As a woman who did have to do IUI for my first pregnancy I remember that journey and also felt so emotional and blessed at being pregnant. My twin girls are now 22, and we have a son who is 17. I had a c-section and then a VBAC so your experiences bring many memories. Wishing you continued positive vibes as things do just evolve and click and before you know it you’re a pro! Love and hugs…which seem odd, but I hope you feel how much I care about you even from long distance and an odd online viewing. Oh my gosh I have baby fever now! We have been discussing for a long time if we want to add a second child, but I struggle with infertility and I am not sure if I can go through this again. I do have a question for the q&a video. With you breast feeding, how are you and Don dividing the care with CC? I breast fed, and my husband in turn changed diapers, and laundry because it seemed that I was always feeding in those first few weeks. Do you divide the overnights, or do you only wake up since your the only one who can feed her? I like to let Don sleep as much as possible at night so he can have the energy to do all he has to do to take care of us and do his own work during the day. Jen, first of all congratulations! It really seems that motherhood agrees with you. Your baby is beautiful. I’m thrilled for you! One little thing I want to ask – you refer to one of the procedures, both in the video and on the blog, as a “spinal tap” which to me signifies that spinal fluid was to be collected. I think you either meant spinal block or epidural right? Having given birth twice (once with a C-Section and once with a VBAC) I had one of each. Again, CC is gorgeous and I look forward to hearing more as you and Don find your way through parenthood. Best wishes to your pack of four. I obviously know nothing about medical terms, LOL. I believe it was a spinal block. What a beautiful birth story, Jen. I had an emergency c-section and I was like you in taking all the time I could at the hospital. It was very nice to have the extra support and time. Charlotte is beyond gorgeous and I’m so happy to see your family grow! Congratulations again! Read this through happy tears for you all. What a perfectly beautiful baby girl. God bless you, Don, and CC!!! So sweet and I totally adore you guys! Just beautiful and I was brought to tears when you finally got to hold her… 🙂 She’s so precious!!!! Congrats! Sounds like a nice, calm delivery and hospital stay. Baby is gorgeous! So happy for you all. She’s so beautiful Jen! So wonderful + exciting!! Congrats to you and Don. I’m SO thrilled for you both! What a beautiful perfect baby girl! Jen you look gorgeous. Don looks so smitten with his little princess. Thanks for sharing your birth story. Welcome to the world sweet CC, you are loved sweet girl! Congratulations on your baby! I am so happy for you both. Thank you for sharing about this new beginning. I hope you know that all your subscribers are so happy for you and Don. You look radiant Jen!! Congratulations to both you and Don.. Charlotte is beautiful and I’m so happy everyone is healthy! This is less of a new parent question and more of a blog/video request: whenever you’re up to it please share what you packed in your hospital bag. Also, I can’t wait to see the finished nursery after you’ve settled into it! I thoroughly love reading your posts, you have such a beautiful way with words, and the way you explain “Mommyhood” just makes my heart melt, if anyone was meant to be a Mother, it was you, by the end of your blog post I was sitting with tears trying hard to escape my eyes, I have followed you for many years now and to follow along on your journey to becoming a Mommy has been wonderful, at times it actually felt like a family member was pregnant because I and many others felt so involved !! She’s absolutely beautiful. Congratulations to you both. Lovely. So nice to see your beautiful daughter and to hear how well you all are doing. The footage of Winnie and Charlotte is priceless. Congratulations Jen & Don! Baby Charlotte…what a fabulous name! It’s served me well over the years! I too had a c section with my beautiful baby Hugo on the 11th (Monday). I think you were actually due a couple of days before me. I’m still a little tender but recovering well at home. I too am loving the new mum bliss, it’s so strange to look at them and know you made them! Amazing! Good luck with everything! I look forward to seeing how our babies grow over the coming year! Wishing you a speedy recovery – cuddles with the little one helps a lot I think! So happy for you all! The video is adorable! The way both of you look at each other and at CC is just magical!! Congrats for your little baby girl. She so beautiful! Congratulations Jennifer and Don. 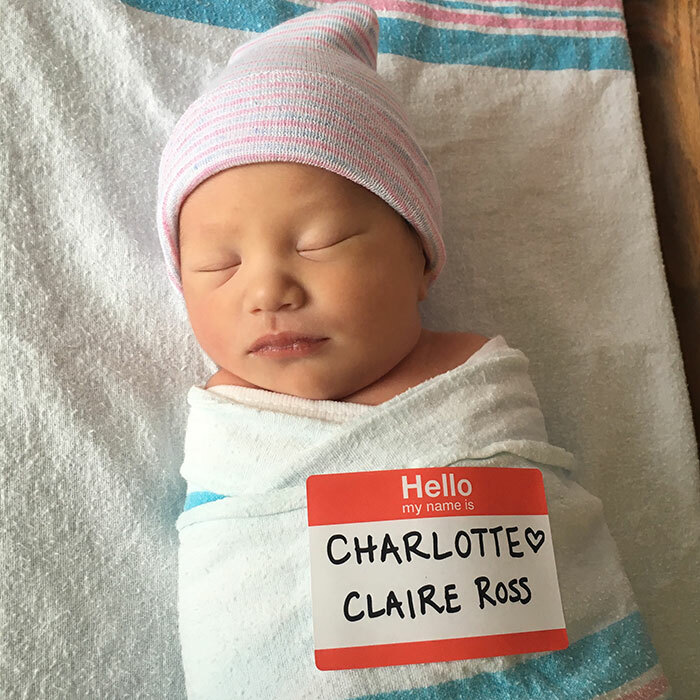 Thank you for sharing Charlotte’s birth story with us. Your happiness is wonderful to witness. Heart warming video, and so wonderful to see the whole family together and so happy! Enjoy that precious gift and each other, I know you will! from the deepest bottom of my heart i’m so over the top happy for you! CC ist so adorable and it brings me so much joy to see you and Don with your little Angel! She is so blessed to be raised by you both! Congratulations Jen! She is so beautiful. Oi Jen, que linda sua bebê. Te acompanho do Brasil Beijos Ju. Hi Jen, your baby is so cute. I follow you from Brazil. Kisses Ju. congrats to your adorable little family, I did the same thing after my son was born, letting him stay in the nursery for some needed rest for mommy. congrats again and looking forward to future updates. Your baby is so cute she looks like a doll. I’m very happy for you and your family. I hope my baby is as cute as yours, my due date is may 29th, until then I will enjoy seing you and your videos. Jen, I have been following you for years. It was the day you posted your What’s in my bag at your kitchen table with the black LV handbag & wallet Don had given you. You have come a long way. I am so happy for both you and Don. The baby is beautiful! So thrilled for you both! I love reading about your journey, as I am a new grandmother of a beautiful baby girl. Looking forward to updates! Beautiful baby and beautiful family! May God bless all of you with health and happiness. So happy for you all. 🙂 Charlotte is so cute and we (my hubby, my son and I) loved the clip with Winnie meeting her. Thanks for sharing. Congratulations to you, Don and Winnie! Charlotte is just precious. So glad you shared your story and I can’t wait to see updates. Take care! Absolutely beautiful! I loved the video clip of Winnie meeting CC, adorable! Parenthood suits you and Don! Congratulations to you both!!! She’s absolutely beautiful. Congratulations!! It’s fun to watch the two, three and four of you interact with one another. CC is blessed and so are you and Don. Happy for you and it’s cute to watch. Brings back fond memories, my children are grown and have children of their own, so it’s great to reminisce through your experience my own which seems so long ago. Cheers and a genuine Happy New Year!! This post made me cry! It is such a joy to read and hear all about the birth of your new baby girl! You can tell in your writing that you are overjoyed! I’m so happy to be able to watch your little family grow! Many prayers and wishes for more sleep, more newborn cuddles and many more happy years! Jen, you wrote your journey to baby story so well. I mean your writing style is beautiful and you explained things well. I know you are writing in a way so people who don’t know can know and understand. You do that well. Anyways, after reading I was grinning from ear to ear. I’m so happy for your family. Now I just wish I could hold her but I understand that is not possible considering the circumstances. Your family is in my thoughts and prayers. Thank you for sharing your journey and your family. Have a blessed new year. Haven’t watched the video yet, but already crying whilst reading your entry. Jen, I am so happy for you and Don. Many blessings. Have I missed the video of the new nursery? Congratulations! I’ve followed your pregnancy and am so happy for you, Don, CC, and Winnie. Enjoy the time with your baby girl! I have been watching your video’s for a couple of years now but have never left a comment, but I just wanted to say congratulations to both you and Don and (winnie) of course lol on the arrival of your beautiful baby girl Charlotte! Baby is georgeous just like mom and dad, she is so cute and adorable. I love Winnie pictures and her darling face with the cute bows. You always look happy and beautiful. Hope to see more of Charlotte and Winnie. I like the way Don in the video said “three princesses all together”…so true. Have a blessed 2016. What a sweet family.I started watching you at thanksgiving time.I seen your face and heard your voice and was reminded of my beautiful daughter. She is so far away with her sweet family,as her husband is an Army officer deployed right now.She is always resting heavy on my mind when she is at home with the babys waiting for the return of her wonderful hubby.She now watchs you and can not believe the uncanny likenesses you both share.Thank you Jen for sharing your wonderful life with my daughter and I.
CC is absolutely beautiful – and I don’t say that about many babies! Thanks for the helpful post! I was 10 days late so I had to get induced which was pretty uncomfortable for me. But I chose pain medication during labor so I wasn’t in much pain which was lucky for me and I only pushed for a few hours ( I know that is rare). My husband still says to this day how happy he is that I didn’t push for too long. Truth be told I was feeling pretty good after I had her and could’ve had friends over but only had close family. I also brought my own pillow and took a nice shower the next day and ate some food to get my energy back and accepted the stomach and pain mediation, but only took it for a few weeks at home once a day just in case. It really ended up helping me recover and feel comfortable. I think a lot of it is your attitude and although I was a little nervous when I had to push I knew it was only temporary and that soon I would have my baby.